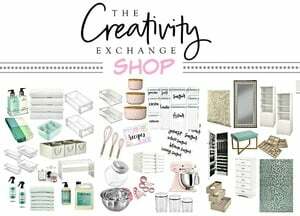 I have had so many comments and emails from readers wondering how we created our built-in counters and shelving for my new office/craft room revamp that I wanted to dedicate a post just for ways to create built-in shelving and cabinets on a tight budget. 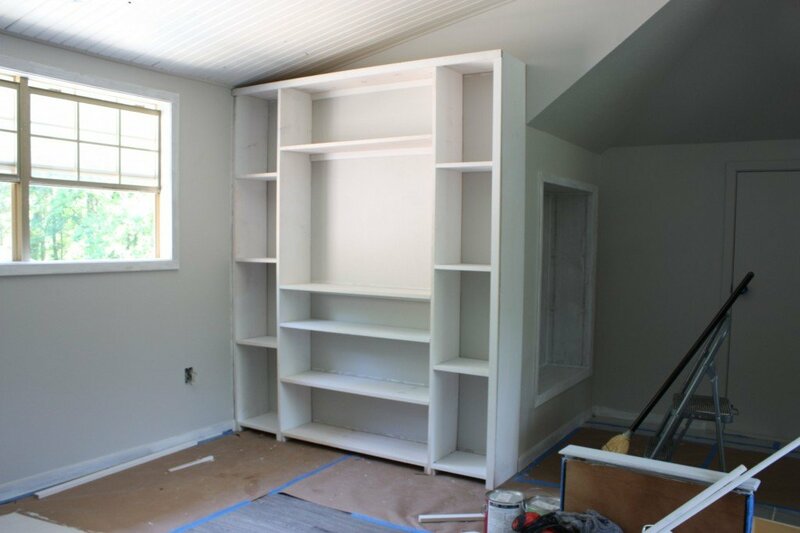 I had a very small budget for my built-ins and since I hired a contractor for this bigger job, I needed to minimize the time that he spent on project overall. If you can believe it, all of my built-ins and counters for this space cost me around $800.00 (including contractor labor and materials) and they all went up in less than 6 hours total! 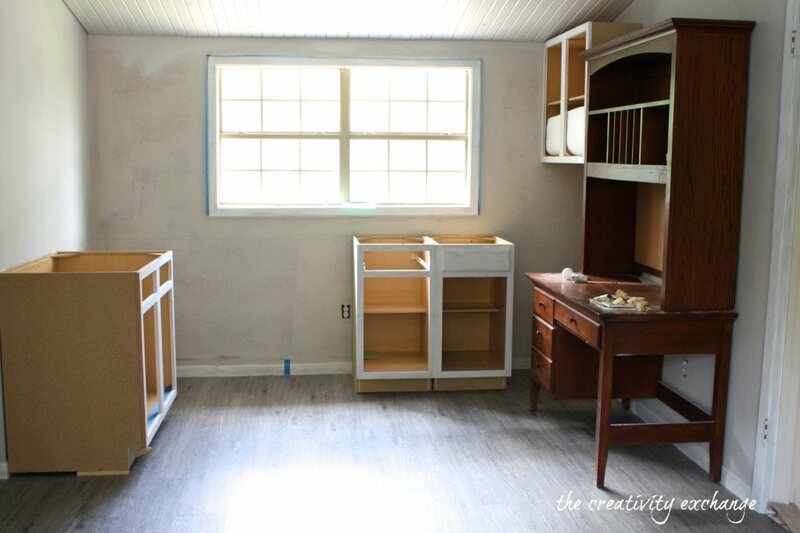 I know it sounds crazy but because we used inexpensive pre-made unfinished stock kitchen cabinets from Lowe’s and we used standard size plywood (no special cuts were needed), I saved so much money and time. 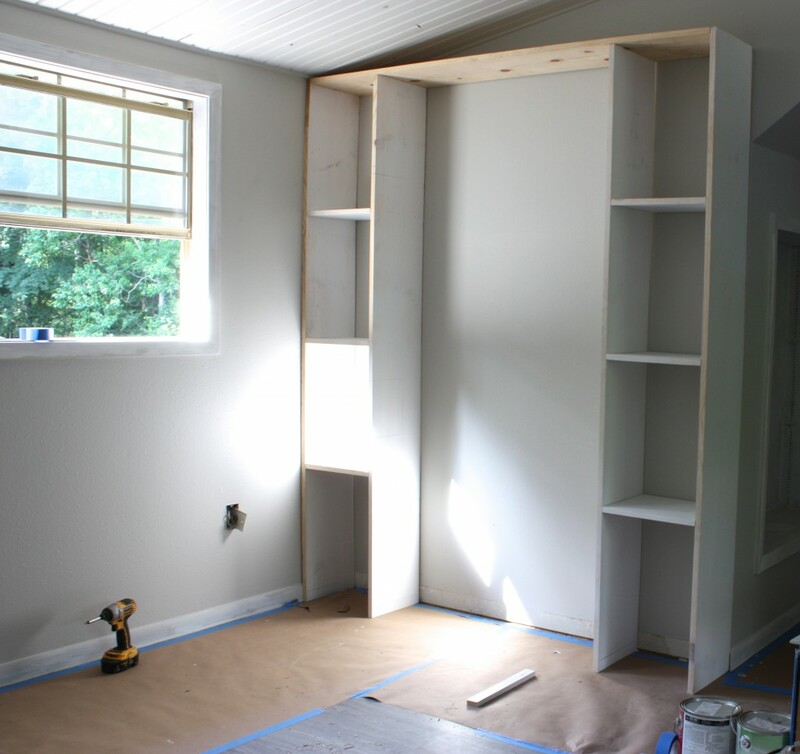 If you have always wanted built-ins for a specific space but thought it would be way to expensive to have it done, this post is just for you! If you’re open to using inexpensive pre-made stock cabinets and planning your space around standard width sizes of wood/mdf, creating customized built-ins is very affordable! Also, because we designed the built-ins based on standard width sizes of plywood and standard wood shelving boards, no labor cost was spent cutting down the wood. We also used the wall itself as the backing of the cabinets instead of wood to save even more money. By keeping all of this in mind as we designed the layout, we saved so much time and it seriously made this project so inexpensive. For my countertops, we just purchased a plywood sheet and my contractor cut it down to fit. 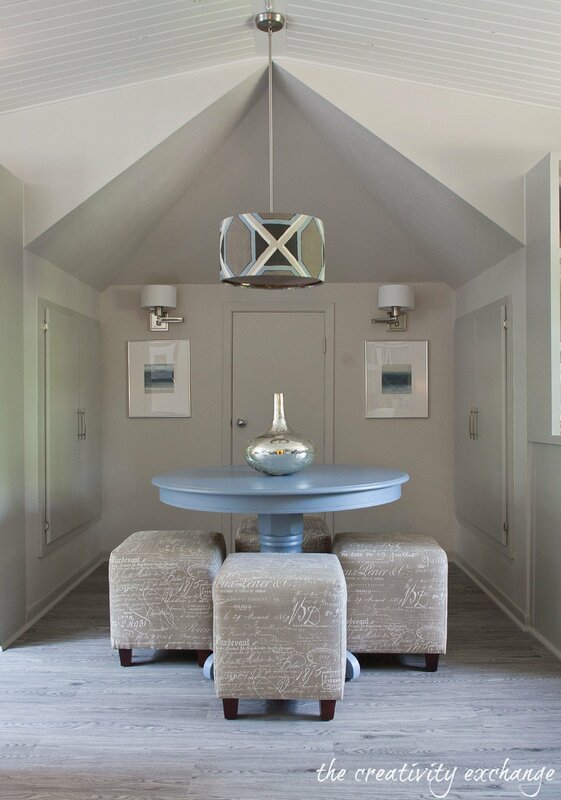 I knew on the front end of this project that if I planned the design with all of this information in mind and worked closely with my contractor for ways that he could save time, the built-ins could be affordable. The other thing that I did on the front end is that I asked my contractor to work on my project on days that he needed to fill an hour or two. In other words, like all contractors, he has so many big renovations that he works on that sometimes he has to wait for tile/flooring to dry or for product to come in that he has a couple hours here and there that he needs to fill. Because I was willing to be patient to save money, my contractor would sometimes bring his whole crew (loved those days) to fill an hour or two but only charge me for his time, because his crew was being paid on other projects and had to wait any way. 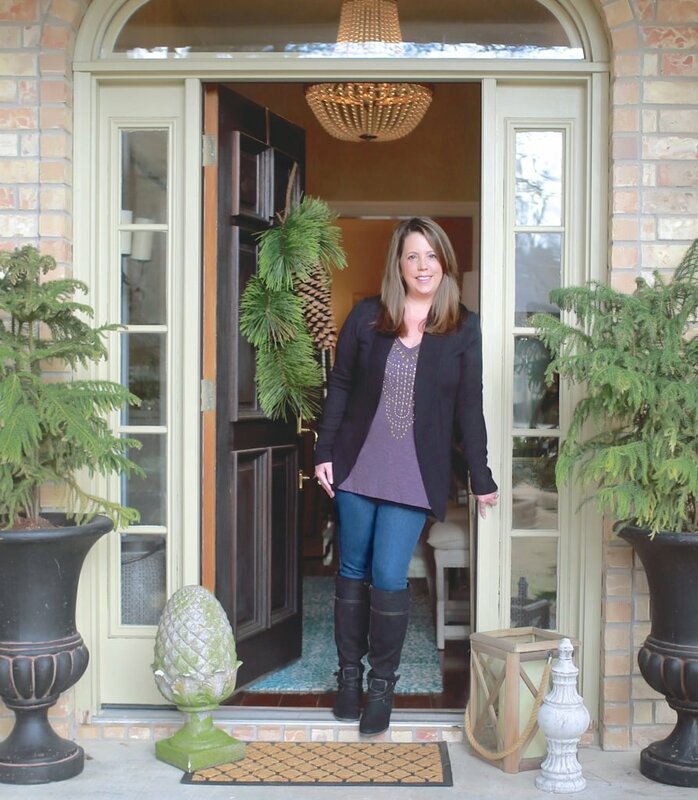 If you do not have a big project and you are willing to be super flexible (I know it’s hard) and ask that your project be done when they have an extra hour or two, chances are that your contractor will make your flexibility worth the while. I always do this whenever I hire a contractor and it has always paid off for me. I hope someone out there can use this information and can see now the creating built-ins and shelving does not have to be a $5,000.00 investment. If you have always wanted them but thought they were unaffordable, I hope you will not rule it out and consider my suggestions for creating your dream space and cutting down the costs. 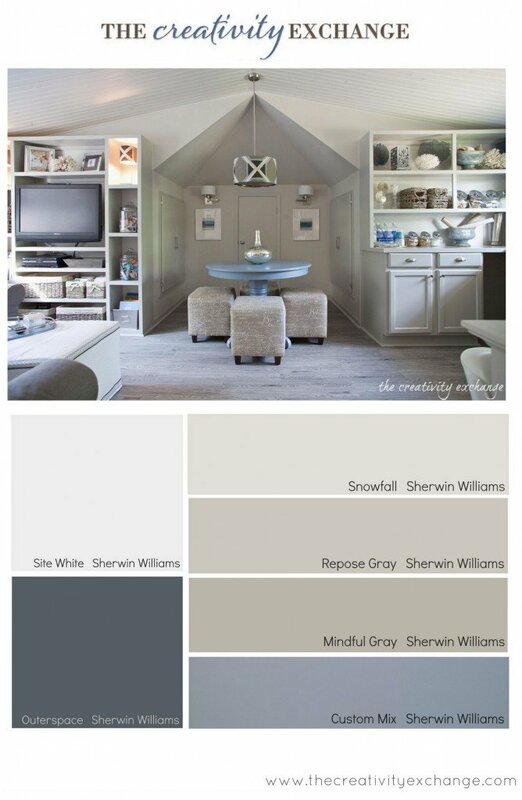 « Office/Craft Room Paint Color Palette (Paint It Monday).. This room is an inspiration for my home office. I’ve been working with my painter on the “come when you can, for as long as you can” and have saved a lot. I’ll try it with the cabinet maker. Thank you Kyle! Yes, I have saved a lot of money by being flexible. It’s hard to do because I want the project done as soon as possible but it’s worth it in the end! What great tips! I never would have thought it could be that inexpensive to have built ins! Your look so high end, you would never know they were stock materials. Thanks for sharing this info. Amazing tips, Cyndy! They are beautiful!! Any suggestions as to what cabinet base to use if you need file storage? I’m trying to design an office/craft area and office credenzas are pretty pricy. 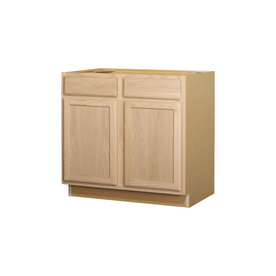 I think if you search online or check with Lowe’s, you may be able to find stock file cabinets. You could always use an existing desk with file cabinets and work it into your built ins like I did. Good luck and thanks so much for stopping by Margaret! This is so awesome. Gives me goosebumps! You could even buy someone’s cast off cabinets from craigslist or whatever if they are in good condition and save even more. Habitat for Humanity has a recycle store nearby and they always have so many nice cabinets that were torn out of houses. Now I know I’ll be adopting some for my next project. I was thinking of Ikea shelving and cabinets before, but you just saved me a lot of money. And I get feel-good points, too. Thanks! Yes Veronica, I too was originally thinking about Ikea’s shelving but after pricing everything and putting it on paper, I came out ahead and installed more storage space by using the stock cabinets. Simply divine, I never tire of looking at it. Americans have bigger rooms than us Brits, what a shame for us. You deserve a medal! Regards, Jackie. We nailed 2 inch trim molding to the cabinet fronts and top to give it a pretty finish! We also did this to media built-in as well. You can buy it pre-primed or not. Okay …I know I’m being a pain in the … but, how thick are the upper portions side walls ..?.. are they mdf or plywood. Who knew they’re be so many questions ?? lol. Great ideas! Since you used plywood for your counter tops, how did you finish the surface? We primed twice and sanded it down and used a matte oil base finish with a lot of Penetrol. I am having glass cut and beveled to go over the counter. The countertops are not ideal for my painting and crafting without some sort of protection. I could have done formica or something else but I really wanted the countertops the same color as the built-ins. Hi there — this looks beautiful! 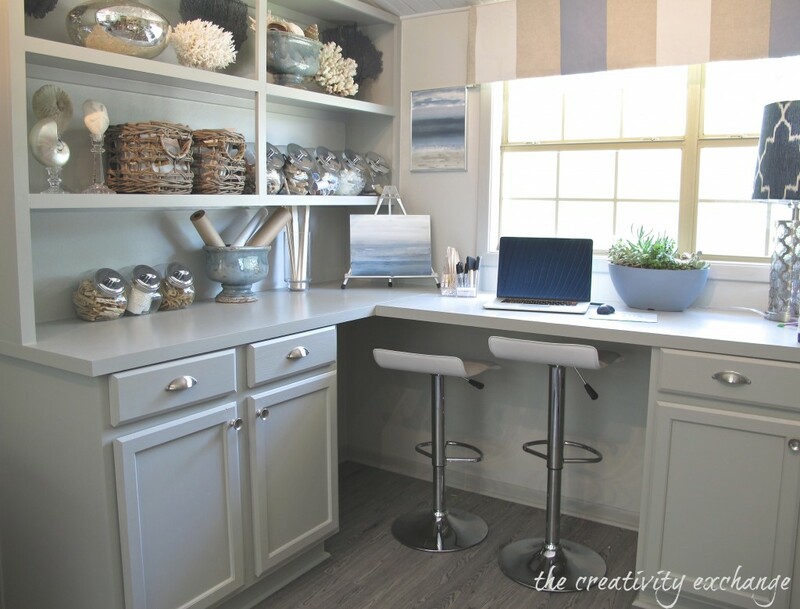 I’m considering doing something similar, but have noticed that stock base cabinets tend to be taller than a standard 30” desk. If yours are the standard 34″ height, have you found it manageable to have a nonstandard desk height? 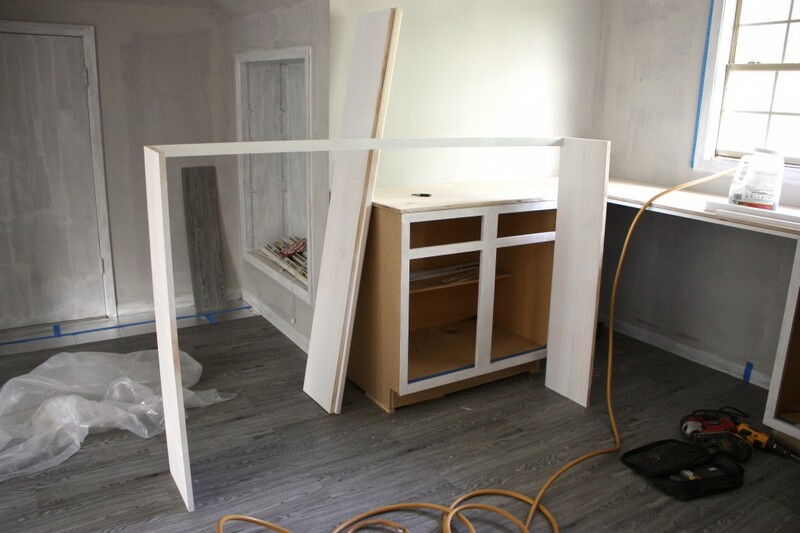 Did you contractor use one or two layers of plywood for your counter tops? They look so thick. I’ve been looking at some 3/4″ plywood at Lowes that has a great look, but I don’t know if it will be thick enough and wonder if they doubled up the plywood, or gave it a thicker edge/trim to beef up the look. 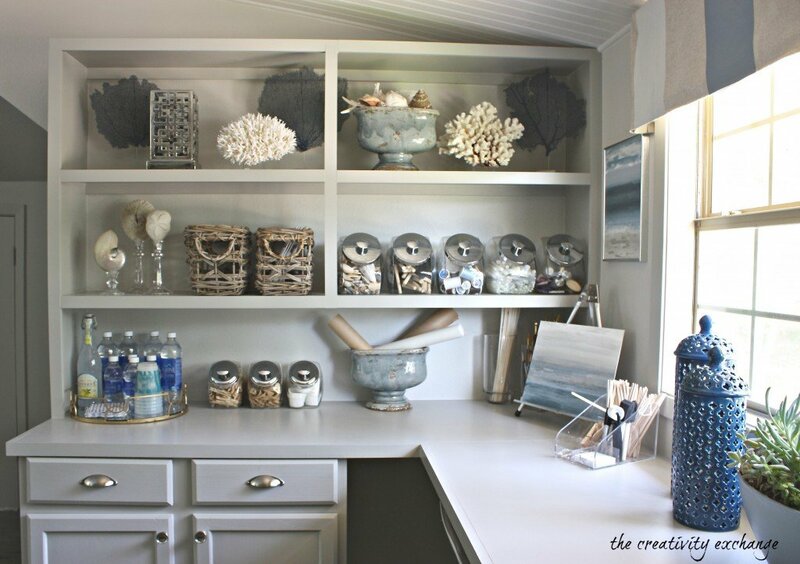 I would like to know what steps you took to paint the cabinets? Did you use a sprayer? I am building (with help) a set of built-ins in my living room. I really want the finish to look great. To have the job done professionally would cost around $850, so I will be doing it myself. I love it, but when I went to Lowe’s they only have cabinets that are 35″ high in stock. 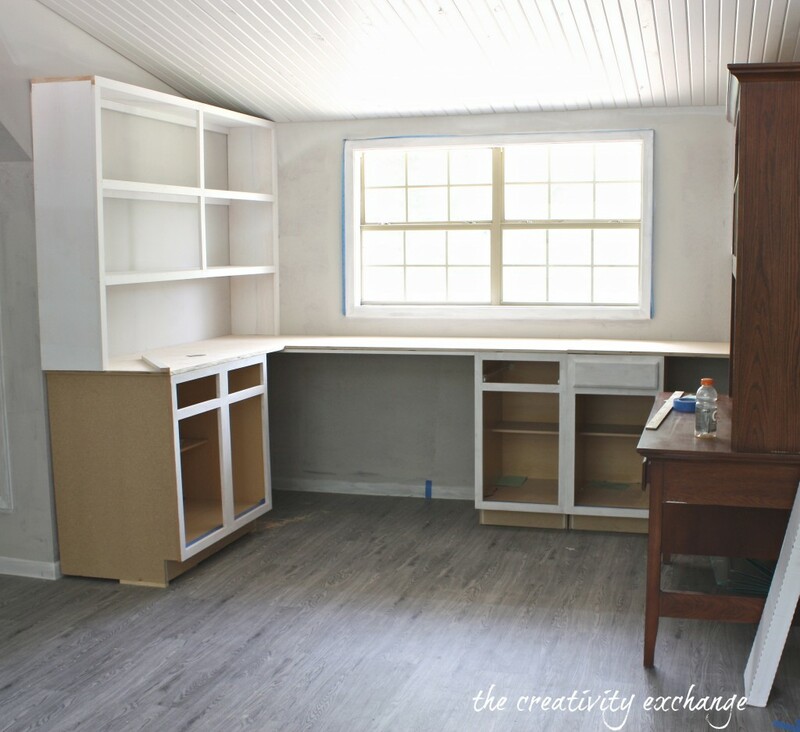 I want to make a craft room with desks for sewing, scrap booking, etc., and I can’t find cabinets that are 30″ high for crafting unless I special order them. How are you managing. I don’t need any more neck or back problems. 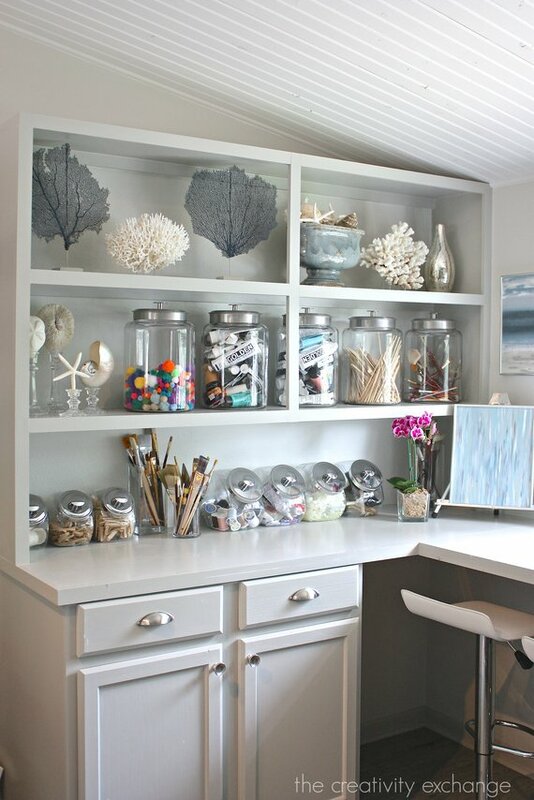 Where did you get the jars with stainless lids that you have on your craft area shelves. (You have them in two sizes.) I need them for my new pantry! How did your contractor attach it to the wall? This is awesome. i want built-ins everyone in my house, but they are soooo expensive. 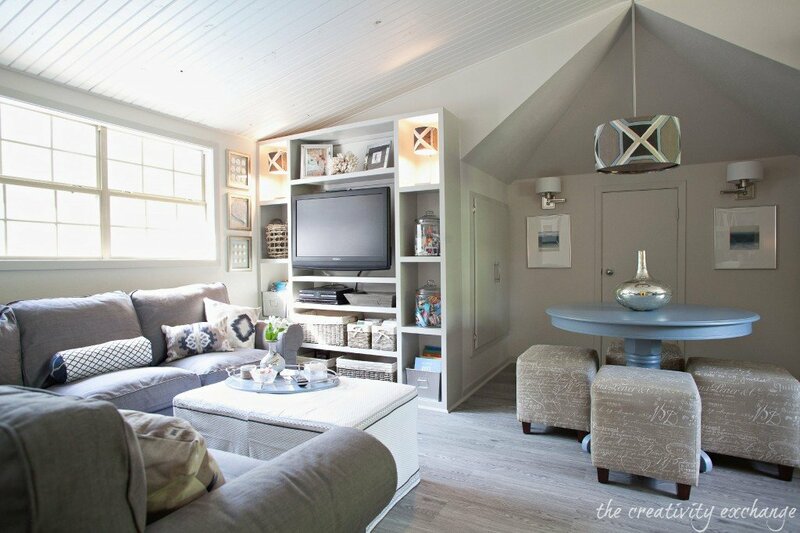 For the shelving around your TV, do you paint the wood before or after the builder assembles everything?